Since 2010, the Jobcenter in Leer/East Friesland cooperates with the Herinnerungscentrum Kamp Westerbork across borders. Young long-term unemployed people from the rural district Leer already were entrusted with construction works of the historical hut in which, among others, Anne Frank was accommodated during her time in the transit camp. These and other works in Westerbork are funktionally maintained by the educational provider “Working Group School Rhauderfehn“. 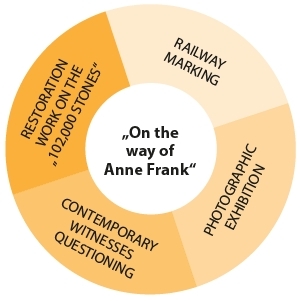 The project “On the way of Anne Frank” is the consistent continuation of this partnership of the rural district Leer with the Working Group School on the one hand and the Dutch municipality Oldampt with the Herinnerungscentrum Kamp Westerbork on the other hand. Overall, the project comprised five parts, which were realized within the three-year term until the 30 April 2015. On the area of the former transit camp in Westerbork German and Dutch formerly long-term unemployed people restored the monument “De 102.000 steenen”. By the end of June 2014 already 92,190 stones were restored by the eight German and five Dutch participants. On 8 December 2014, the work was officially completed successfully. The reactions of visitors of the outdoor area of Kamp Westerbork are positive. Contemporary witnesses who saw the deportation of the people from the camp Westerbork in the direction of the concentration camps, tell on camera about the events of bygone days and their related personal story. The recordings of witnesses can be found on this website in German, Dutch and English. Furthermore, all interviews are accessible as original language YouTube files and are filed in writing either in German or Dutch. In addition, in close cooperation with pupils from the Teletta-Groß-Gymnasium Leer, headed by Ms. Lax, the brochure “Searching for traces along the tracks” was created and presented to the public in October 2014 at a press event. In this brochure, among others things, interviews of contemporary witnesses who saw the deportation trains are documented. The brochure was printed in circulation of 3000 copies and distributed to schools and institutions in the rural district Leer. The research and documentation of findings of “Silent witnesses” within the region is also part of the „Contemporary witnesses questioning“. Parallel exhibitions on German and Dutch side created a visual and interactive connection to the witnesses who were interviewed within the project and who shared their personal experiences and reported about the deportation trains. The exhibition dates and places could be found on this website. Sculptures of citizen employee Doris Ricci were shown at the exhibitions, too. These were manufactured by her based on her activity at the renovation of the 102,000 stones and represent a variety of motives of the Jewish persecution. Installations along the former railway line from Westerbork towards the concentration camps shall commemorate publicly the historic events. On German and Dutch side memorials along the tracks have been installed. On 18 March 2015, the memorials in Weener, Leer and Bunde were presented to the public. On 02 April 2015, the steles in Winschoten, Zuidbroek, Nieuweschans and Hoogezand / Sappemeer have been unveiled.